After months of hard work, we’re delighted to announce the new version of chatbots.org, creating a, in our opinion, world-class community platform for professional chatbot developers. We’re glad we’ve managed to implement so many wishes of chatbot developers world wide and we’ve added lots of functionality that we believe advances the chatbot community across the world. Please read on about our tightened mission, the new functionality, new content, the history, the community, the future, and how your participation could help you create success, learn and get in touch with professional partners. 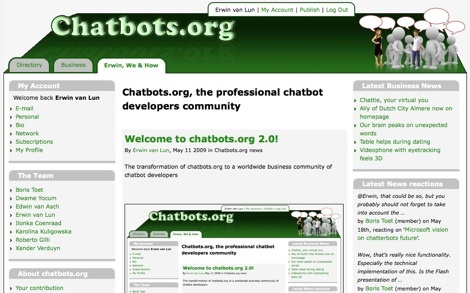 Read more about: Welcome to chatbots.org 2.0!